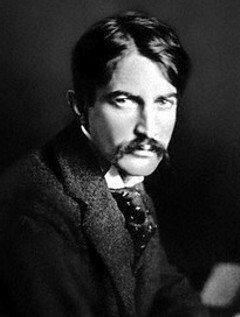 American author Stephen Crane (1871-1900) won international fame with The Red Badge of Courage, which was acclaimed as the first modern war novel. Crane's works introduced realism into American literature, but his innovative technique and use of symbolism gave much of his best work a romantic rather than a naturalistic quality. Crane was born in Newark, New Jersey, in 1871, the fourteenth child of a Methodist minister. He started to write stories at the age of eight, and at sixteen he was writing articles for the New York Tribune. Crane studied at Lafayette College and Syracuse University, then moved to New York, where he lived a bohemian life and worked as a freelance writer and journalist. While Crane supported himself by writing, he lived among the poor in the Bowery slums to research his first novel, Maggie: A Girl of the Streets. Later, he became a war correspondent and traveled to Greece, Cuba, Texas, and Mexico to report on war events. His short story "The Open Boat" is based on his personal experience aboard a ship that sank en route to Cuba in 1896. Crane spent several days drifting in an open boat with a few other passengers before being rescued. Unfortunately, this experience permanently impaired his health. In 1898, Crane settled in Sussex, England, where he lived with an author and the proprietress of a well-known brothel. In 1899, while in Greece, Crane wrote Active Service, which was based on the Greco-Turkish War. He then returned to Cuba to cover the Spanish-American War. However, shortly thereafter, the tuberculosis and malarial fever that he contracted during his Cuban shipwreck experience overcame him. Crane died on June 5, 1900, at the age of twenty-nine in Badenweiler, Germany.